We spent the last two weeks on this theme and I am so glad we did! Olivia loves animals and there are so many great things that can be taught with animals. Plus, spring has arrived! What better time to learn about the zoo then during the springtime? 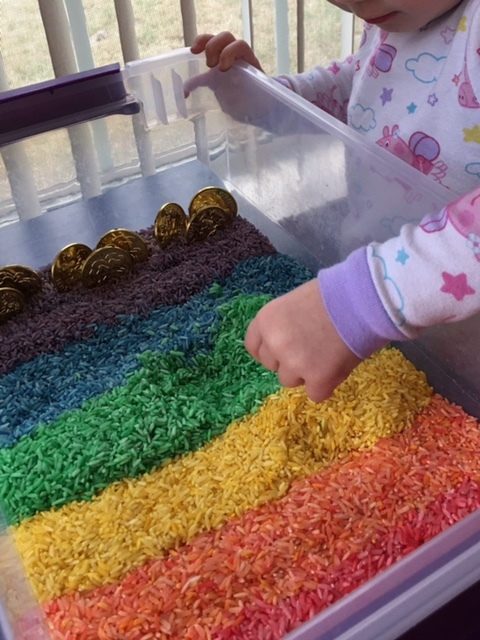 We started with a fun sensory bin! I just added popcorn kernels ($0.98 a bag at Wal-Mart, and I did four bags...three would have been plenty though!) and some fun toy animals I bought from Amazon! Then I downloaded this great Alphabet Zoo ABC Chart from Live, Love, Laugh Classroom's TpT Shop! It is free, and you will want to print two of these for the ideas planned this week! Olivia dug for all of the animals, and even buried some of them again! Then she matched them (the best she could) with the chart! Next we decided to have a yummy zoo themed snack! (and by "we" I mean...I decided...and she looked at me like I was crazy!) :) In the end, she loved it though. Celery, cream cheese, raisins, and animal crackers. Note: she hated the celery. lol. Olivia loved building the zoo. I thought it was adorable and interesting that she wanted to put the animals on top of the "cages." Every time I would move one IN the "cages" she would say "awww." I left these blocks out like this for about three days and the kids loved playing with them every night! Z is for Zoo right? We had to put a paint and motor skill practice in there some where. So we did Z is for Zoo Dot Art. The paint dabbers are of course, from Amazon! We have had them a long time though, so even though they are more than a few bucks, they last forever! I am so pleasantly surprised at how well Olivia is doing with her motor skills on these activities! You better believe we will keep at it, she is doing great and loves them! In addition to our Z is for Zoo activity, I wanted to do some matching and letter sound practice. It was time for another sensory bin! I took another one of those charts from our first activity (you can use the same one but Olivia had messed our first one up) and cut apart the letters. Throw some Easter grass in the bin, and those letters...done! She found the letters, lined a few of them up, and we talked about letter sounds! It took her a few minutes to warm up to the texture of the grass, but then she loved it! Next we did a simple animal cracker counting activity that I completely took from Mrs. Plemons' Kindergarten Blog! I made my own Animal Cracker Counting Mat but the idea was all hers! And of course, we had to throw in this awesome Melissa and Doug Zoo Puzzle! When we do things like this, I just let her have quiet time and I do not ask questions. I love to see what she does with the animals and I love seeing her sense of humor. She thinks it is so funny to put them in the wrong spot, she laughs, then switches them to the right spot! On a pretty day, we decided to take our zoo activities outside and enjoy some water play. I bought some larger animals on Amazon! Olivia loves water play, so this was simple. Add some water, tear-free shampoo, and animals! Oh and a sponge or scrub brush! We just used an old bottle brush! We played with this for around 30 minutes, yes she was soaking wet, but that is okay! I have included this in my Zoo Dot Art file from above! :) If you want it, feel free to download the file and print! Honest moment...we are doing our St. Patrick's Day activities a week early! Why? Well, Spring Break falls right during St. Patrick's Day, and we have a zoo trip planned, and time with Gam, and Mimi, and just so much fun crammed into one week that I do not see St. Patrick getting any love. So, here we go! St. Patty is happening a week early! Bring on the green! Well we actually started with rainbows, but its all in keeping with the theme, right? I started off Monday with a pop of color and Olivia loved it. Sunday night, I mixed up some rice into 6 different bags. I added a tablespoon of water to each bag and then some food color. Shake, shake, shake...and viola! Rainbow rice. How did it make it perfectly straight? Simple. I folded a piece of cardstock and used it as a divider as I poured each color into the bin. The coins at the end of the rainbow (gold, if you will) are from the Target dollar spot! Olivia acted like she didn't want to mess it up at first, but then...she threw caution rice to the wind. I mean, rice was everywhere...I would have done it outside...but it was raining. Dyson to the rescue though, no harm done. It is even pretty when it is all mixed up! Next, we took a break and had a little homemade, organic, St. Patrick snack. (yeah, no.) People, my child won't eat...like ever. She gobbled these up. So I think we will have it for breakfast, lunch and dinner the next two weeks. I'm only kidding...maybe. So I made a cute template to use, and we started painting. If you want my Marshmallow Shamrock Template, click the link! I didn't get many pictures of her doing it because I had to hold her hand to get her to stamp in the correct place. So, so cute though! The next day we had some fun with Play-Doh! We just used green Play-Doh and this Shamrock Cookie Cutter. Play-Doh is wonderful for the little one's motor skills and sensory. We use it any time we can! Next, I created this St. Patrick Number Sort. And are these noodles not ADORABLE? I grabbed these at TJ Maxx, believe it or not! But they are also available on Amazon! However, they are dang expensive there! lol. So If you can find them at TJ Maxx, go for it! I got one bag (which was plenty) for $2.99! If you can't find these, you can use anything green! 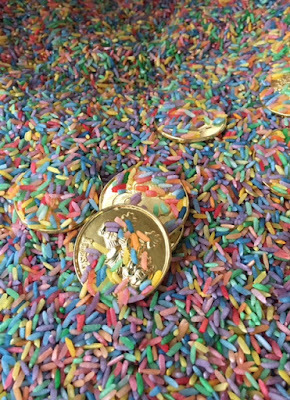 Play-Doh, Pom Poms, Lucky Charms etc. So I just talked about the numbers with Livi. She can now say two and five. :) Then we practiced putting the correct number of shamrock pastas in the circles! Remember, she is tiny and I don't want to push anything on her...so I just let her explore afterwards with the pasta. She had fun with the whole thing! And to wrap up our week of St. Patrick fun, we did some "Leprechaun Writing." Basically, just Wilton's Green Sprinkles (they sparkle a bit in the sun) and a cookie sheet! She loved doing this! I loved it because it wasn't too messy but she still had fun! I would recommend doing it outside though, the sprinkles littered the grass quite nicely. lol. So, even though this a week early, I hope you enjoy these St. Patrick Activities at home with your little ones! Spring Break is next week, so I will be taking the week off from blogging and enjoying my little ones at the zoo, park, and other fun places! I love me some Dr. Seuss. (yes, I know that was grammatically incorrect.) I mean, I love the creativity, the rhyming, the pictures...I love it all. To say I was a little excited about this week would be an understatement! Olivia and I started out with Ten Apples Up On Top! We read the book, then we practiced our block stacking skills. The girl is a champ when it comes to stacking blocks, so she loved this! I also printed these fun number cards! These are free in Star Magnolia's TpT Shop! I laminated them and then had Olivia just play with them. She is too young to really do much with them, but I was able to talk to her about the numbers and she could point to one dot, two dots, etc. Rex also enjoyed ordering them when he got home after I read the book to him! Next, I found this adorable video on YouTube! It is Ten Apples Up On Top to a Jason Mraz song! Livi was totally hooked on this! I had never made play dough before with marshmallows but I may never use anything else again! I loved the consistency, and the smell! Olivia was a big fan of it also! Next, we read Green Eggs and Ham! I love this toddler version, Olivia liked squeaking the egg at the top and spinning it! She enjoyed the story too, but let's be honest, the egg was her favorite. After we read the book, we "cooked" some green eggs while working on our letters! Each egg has a letter or picture. I would show her the letter and the corresponding picture. (A, Ant...etc.) Grab the Green Egg Printable and try this one with your little ones! Olivia is my little chef, so she loved using mommy's pan! And in case you need a good laugh and want someone else to read the book to your child...Tebow does a great job! I died when I saw this. We finished up our week with Put Me in the Zoo! This book is all about colors and Olivia loves her colors! She is getting close to being able to actually say them all, so proud about that! And FYI...her hair looks REALLY strange in this picture, but it is just the angle. lol. Then the I drew the faces on the plates after they dried (just using a Sharpie) and then the kids glued on little pom poms and googly eyes! I mean googly eyes are where it is at people. I loved the finished product! And, because the rest of the week will be jammed with appointments and things, we had to wrap up "Seuss Week" today! 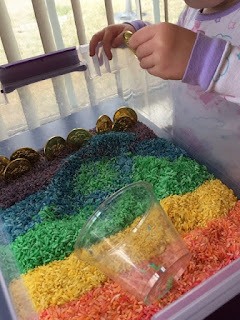 We did our last activity which was a sensory bin. To be honest, I just threw in things I already had...we all know Seuss loves colors! So does Olivia! It is a bit of a hot mess, but it was free! So, tomorrow is Dr. Seuss's birthday! Definitely not too late to try some of these with your little ones! Have a great rest of the week and HAPPY MARCH!